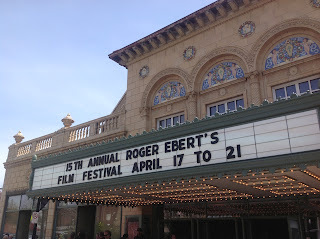 The culmination of the 15th annual Roger Ebert film festival was bittersweet in many ways. It was my first time at the festival and even at the Virginia Theater, and having missed seeing Roger in person will always be a regret of mine. Chaz Ebert had mentioned before that this festival was a comfort to her in her time of grief. Her whole family was there to support her and all 1,000+ people that filled the theater were there to support her too. I don’t know if I have ever been in a place with that many people sharing an experience of support and honesty along with a love for film and Roger. The fact that comforted me (and all of the other attendees, I’m sure) was that Roger chose these movies for us. He carefully selected these movies, he placed them in an order with great care to the feeling of the film and how the audience would feel after watching them. I actually spoke with fellow Slacker Andy on the phone before I left for the Virginia and I choked up and said, “I can’t believe it’s over. I’m devastated.” And I was. I am. It’s been a whirlwind of emotions and listening to people talk about their craft and passion was inspiring. I don’t know that I’ve ever felt quite so invigorated. I met some of these people just a few days ago and yet, I already feel like I know them so well. Movies brought us together and final hugs and handshakes were happening all around. But, without further ado, let’s hop into the final films. "Critic's Picks: Roger Ebert -- An International Tribute" was a surprise short that one of the far flung correspondents, Kevin Lee, put together with the help of the other correspondents. It was a tribute to Roger and personal for Lee. It dealt with Ebert’s top ten movies of all time from 1982. His words were read and bits of a few of the movies were shown. The part that struck me the most was a line from Citizen Kane, "A fellow will remember a lot of things you wouldn't think he'd remember. You take me. One day, back in 1896, I was crossing over to Jersey on the ferry, and as we pulled out, there was another ferry pulling in, and on it there was a girl waiting to get off. A white dress she had on. She was carrying a white parasol. I only saw her for one second. 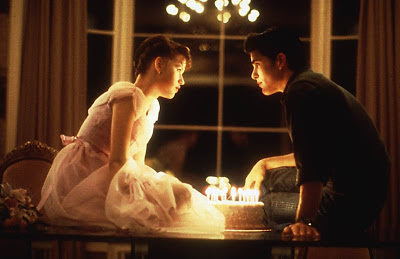 She didn't see me at all, but I'll bet a month hasn't gone by since that I haven't thought of that girl." For some reason, it made me very emotional. I was already vulnerable because the festival was coming to a close, but I think that this line in particular made me feel more connected to humans and nuances and the little things we all notice in life and consequently, in movies. And I love movies that make me feel more in tune to the human experience. It also reminded me of Roger; I just love the way that movies were such a big part of his life and I love that the movies that he chose made life a big part of the movies. The feature film was called “Not Yet Begun to Fight”. It was an extremely moving and poignant documentary that followed a diverse group of new veterans as they try to re-acclimate themselves to civilian life back in America. The movie follows these men as they embark on a journey to picturesque Bozeman, Montana where they will be part of a veteran-aimed fly fishing-centric program for a week. This nonprofit program named "Warriors and Quiet Waters" is spearheaded by retired Marine Colonel Eric Hastings. He explains that as a pilot in Vietnam, the rivers that he saw from the sky reminded him of the rivers back home in Montana, so much so that he dreamt of fly fishing at night. When he returned home in 1969, he suffered from PTSD in a nation that was decades away from diagnosing it, let alone treating it. So, he took to the rivers and fished. This hobby and the solace he found in it “saved his life”. Hastings felt a calling to pass on this knowledge and every year he plays host to veterans fresh from the battlefields and recovery rooms to teach them to fly fish. This candid, unscripted portrayal of a week in the lives of these brave men brought me to tears multiple times. It spoke of their struggles, yes. But, it was about a group of people coming together to heal some very deep wounds, both physical and psychological. I love that this movie is apolitical. This movie has no agenda. It isn’t anti-war or pro-war. This freedom allows you to simply take in the emotion of this journey without any filter coloring your intake. In a touching moment, Hastings watches as a veteran casts a line successfully and quickly fights a fish and reels it in. This brings the man to tears as he silently compares this to his own experience, “You know, this river healed me.” He also describes why fishing helps him so. After these men are trained killers, it's difficult to exist normally back home. The act of being outside and patiently waiting for a fish, then fighting it and eventually holding this living creature in your hands and then releasing it, unharmed, back into the water is a powerful lesson for these men. We were lucky to be in the presence of the producer/director, Sabrina Lee, one of the subjects of the documentary, Marine veteran Erik Goodge and executive producer Steve Platcow. The question and answer session with these three involved so closely with the film was illuminating and moving at times. Goodge received a standing ovation as he was ushered onstage by Chaz. The idea for this movie sort of fell into Sabrina's lap and she knew it was a golden opportunity. Platcow related this movie to a story from his own life, a grandfather that he never met. Goodge explained how he had changed since the filming, for the better. Could Roger have planned the uplifted feeling that I felt after viewing this movie and listening to these people talk about it? It seems impossible, but... we'll never know. I was content with the feeling that this movie left me with -- sad, and yet hopeful. Touched by humanity even in times of darkness. It was a great note to leave on. It mirrored the feeling of the festival in general as it soldiered on without its namesake. I am truly saddened that this whirlwind of a festival is over already. But, rest assured, Chaz guaranteed the audience that Ebertfest 2014 is on the docket, and we simply cannot wait!